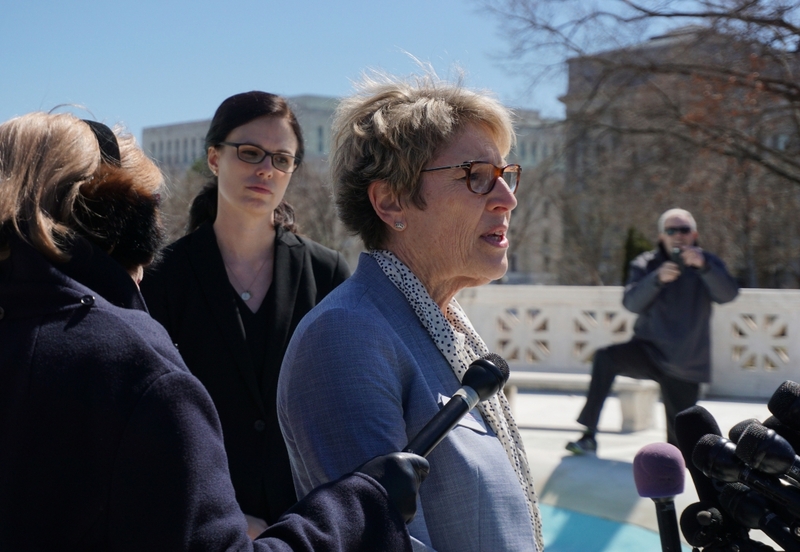 WASHINGTON – U.S. Supreme Court justices appeared willing Tuesday to rein in partisan gerrymandering — desperate even, for attorneys to give them some sort of manageable numeric standard by which they could determine how much politics is too much when it comes to redistricting. Justice Samuel Alito, a George W. Bush appointee, and Justice Neil Gorsuch, a Donald Trump appointee, both seemed hung up on the lack of a numeric solution to the problem and fixated on alternatives to court intervention. 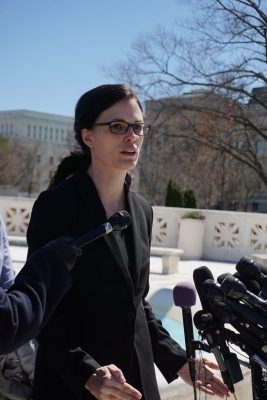 She represented the League of Women Voters and other plaintiffs in one of the two North Carolina cases. Riggs presented justices with a three-prong test that she said they could use to identify maps that are extreme outliers and thereby unconstitutional. The test involves identifying partisan intent — which would have to be district-specific — showing a severe and durable effect from that intent, and determining if there is any justification for it, such as the political geography of a state. For example, justices were provided in the League of Women Voters case with 24,000 simulations of maps that considered traditional redistricting criteria but not political data and over 99 percent of them did not yield the 10-3 Republican majority in the state’s congressional representation that the enacted map did. 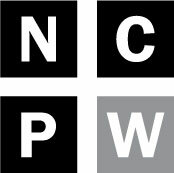 Paul Clement, the attorney representing North Carolina lawmakers, told justices that the plaintiffs’ main complaint was, in effect, about a lack of proportional representation — a system in which parties gain electoral seats in proportion to the number of votes cast for them — which isn’t a right protected by the Constitution. He pointed out that 162 of the 24,000 simulated maps did produce a 10-3 Republican advantage in Congress. He added that what makes the North Carolina maps “unfair” (but not unconstitutional) is lack of proportional representation and the ability and discretion of the legislature to choose one of those 162 maps. And once he brought proportional representation up, the conservative justices didn’t let it go. Their fear of setting a standard that resembled any form of the concept dominated their line of questioning. “Do you deny that built into this is the idea that we should at least have proportional representation-light?” asked Alito of Riggs’ three-prong test. He indicated that a partisan effect in drawing congressional maps would have to be measured by a degree of deviation from proportional representation. Gorsuch agreed and said at one point that a partisan gerrymandering case that dictated an electoral outcome — as in North Carolina — would turn on numbers. At one point, Gorsuch posed a point blank question to Emmett Bondurant, who represented Common Cause and other plaintiffs in one of the North Carolina cases, as to whether the plaintiffs were asking the Court to mandate proportional representation. He added that to determine that a map is unconstitutionally gerrymandered, courts would have to look at whether a plaintiff proved an intentional and predominate partisan intent to discriminate. Gorsuch then turned his questioning toward “citizen initiatives” and asked why they weren’t enough to solve the issue of partisan gerrymandering. Bondurant reminded him that that not all states, particularly the ones east of the Mississippi, including North Carolina, have a mechanism for citizen-led reform. Gorsuch, however, was unfazed. He asked both Bondurant and Riggs more questions about state Supreme Court options to fix partisan gerrymandering and the ability of those states without citizen-led reform to amend their constitutions. Another Trump appointee, Justice Brett Kavanaugh similarly asked about how the recent popularity of redistricting reform and attention from Congress to the issue could factor into a solution. “In other words, have we really reached the moment, even though it would be a big lift for this Court to get involved, where the other actors can’t do it?” he asked. Riggs said if the Court does nothing, it will be read as a green light for discriminatory rhetoric and manipulation in redistricting from here on out. 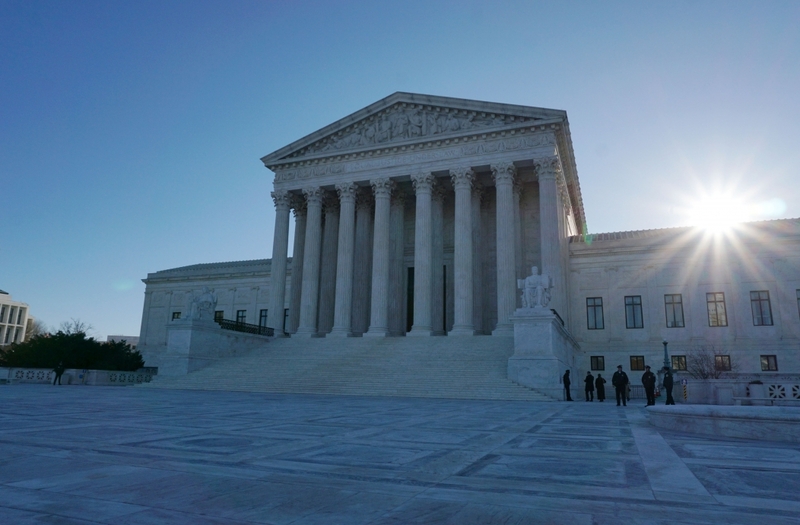 Most of the justices on the Court have expressed a distaste for partisan gerrymandering, and even Chief Justice John Roberts acknowledged Tuesday that North Carolina was an extreme case. Kavanaugh’s and Roberts’ positions, unlike Alito’s and Gorsuch’s, were not as easy to dissect, and it gave advocates and attorneys alike a glimmer of hope that the Court might finally weigh in on the issue. The Democratic justices, in contrast, appeared aligned in their readiness to put limits on partisan gerrymandering. Clement tried to argue that the problem was self-healing, and told the justices that if they got into the business of adjudicating cases like North Carolina’s, it would open the floodgates for political litigation. “And once you get into the political thicket, you will not get out and you will tarnish the image of this Court for the other cases where it needs that reputation for independence,” he added. Justice Ruth Bader Ginsburg, a Bill Clinton appointee, was skeptical. Justice Elena Kagan, who was appointed by Barack Obama, and Justice Stephen Breyer, another Clinton appointee, focused mostly on problem-solving and developing a manageable standard for the Court. Breyer raised the idea of a two-thirds formula wherein if a minority party wins control of districts representing two-thirds of the electorate, a map would be considered unconstitutional. The Court will decide the trio of high-stakes cases before the end of its term in June. Its decisions could change which district maps are used in Maryland and North Carolina in the 2020 elections, and could impact other states’ redistricting plans following the 2020 Census and beyond. All of the cases before the Court Tuesday appeared to raise the same questions from the justices. When asked how the tests presented in the Maryland case compared to North Carolina’s, attorney Michael Kimberly said he actually didn’t see “a whole lot of daylight” between them. “When state officials use redistricting to burden a particular group of voters because of their political views, with the express goal of making it harder for that group of voters to win elections, and when that goal is achieved so that group of voters is ordinarily doomed to usual electoral defeat under the map, and when the state cannot come forward with a legitimate governmental interest to justify the burdens imposed, the map has to be neutrally redrawn,” Kimberly said. Maryland Gov. Lawrence J. Hogan Jr. (R), who has long advocated for an independent commission to draw political boundaries, may introduce legislation in the waning days of the General Assembly session there to change the state’s congressional lines before the 2020 election. But the Democrats who control the legislature are certain to ignore it. Hogan joined fellow Republican and former California Gov. 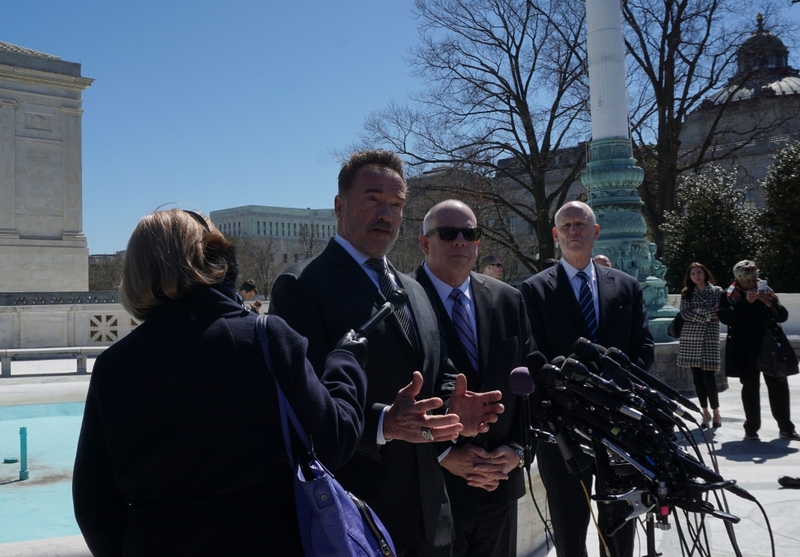 Arnold Schwarzenegger on the steps outside the Supreme Court after the hearings Tuesday. They both said they were hopeful that the Court would act. “There will be no self-healing, because for 200 years this has been going on where the legislatures draw the district lines to protect their jobs and make sure they’re locked in and no one can challenge them,” Schwarzenegger said. He has been an outspoken opponent of partisan gerrymandering, and California approved the creation of an independent redistricting commission under his tenure. “The answer really is just to deal with the redistricting and with the gerrymandering issue and to terminate gerrymandering once and for all,” he said. Several members of the public were also optimistic for a historic ruling from the Court. The line before arguments to get in the building was wrapped around the building, and the first few people arrived at midnight to wait. There were people from Texas, Maryland, North Carolina, and even a group of attorneys visiting from China. 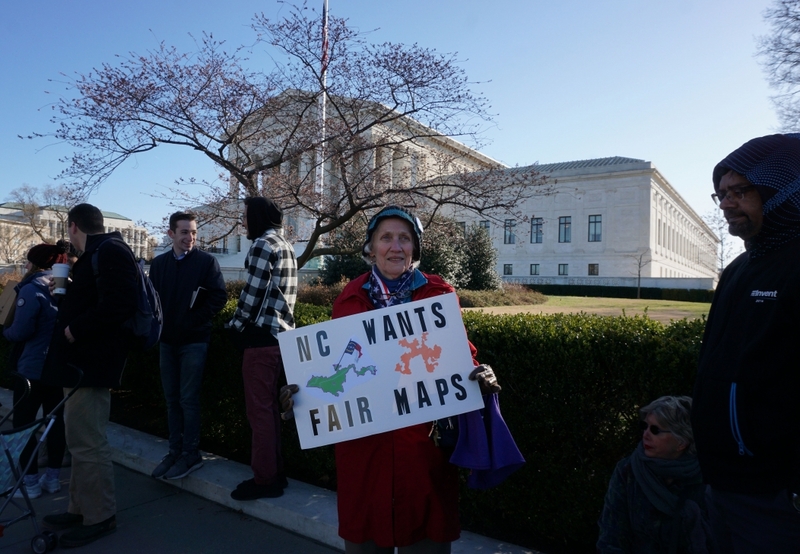 Leona Whichard, a member of the Orange County Chapel Hill chapter of the League of Women Voters got in line at 7 a.m. to see the gerrymandering arguments. Brendan Cooper, a Republican from Maryland, was in line about an hour earlier. He was there to support a friend, who is also a plaintiff in the Democratic gerrymandering case. Robin Bravender, the Washington bureau chief of the Newsroom network contributed to this report.